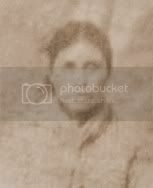 In their 1896 citizenship claim and following appeal, the RM Walker family (Chief Baker's mother's ancestors) claimed their ancestor, Edith (Rogers) Oxford, was the daughter of a Cherokee Indian named John Rogers who was listed on the 1835 Census of Cherokee Nation and living on the Coosawattee. They claimed to be Indian descent by blood through that specific John Rogers. That claim will be the focus of this post. The family said they were Indian descent by blood through Coosawattee John Rogers. The problem is, he was white. People who filed fraudulent claims were under the impression that the Cherokees had no records and therefore would be unable to disprove their claim. That wasn't true then and it isn't true now. All of this information can be obtained from Cherokee records for a man who died prior to the Trail of Tears. Below you see the John Rogers who lived on the Coosawattee River as he was listed on the 1835 Census of the Cherokee Nation. The Coosawattee John Rogers family composition was 4 males under 18; 1 male over 18; 4 females under 16; and 1 female over 16, with one person being white connected by marriage. This information indicates we are probably looking at the family of John Rogers and Tiana Foster. In 1835, John and Tiana would have had at least three sons under the age of 18 (Hilliard, James and Thomas) and four daughters under the age of 16 (Elizabeth, Mary, Sarah and Rachel.) With another son's (Lewis) birth year calculated as about 1837, its possible he was born earlier and was listed on the census, or there could have been an unknown son born who died as a young child. Despite this discrepancy, this Coosawattee John Rogers family found on the 1835 Census of the Cherokee Nation appears to be the family of John Rogers and Tiana Foster. Testimony given by the former Associate Judge of the Cherokee Nation Supreme Court, John T. Adair, on 15 Mar 1888, further supports the theory that Coosawattee John Rogers was the husband of Tiana Foster. Adair gave information on all the Rogers he knew, including Coosawattee John Rogers. John T. Adair said the John Rogers who married his cousin, a Foster, was a white man and lived on the "Chustawatie" River. On a valuation made for improvements credited to James Foster, a notation, dated 16 Sept 1837, says Foster "requested that the above valuation should be transferred to his daughter Tiana Rogers, as it was her just right and property." We have the information from the 1835 Cherokee Nation Census that matches that of the John Rogers and Tiana Foster family. 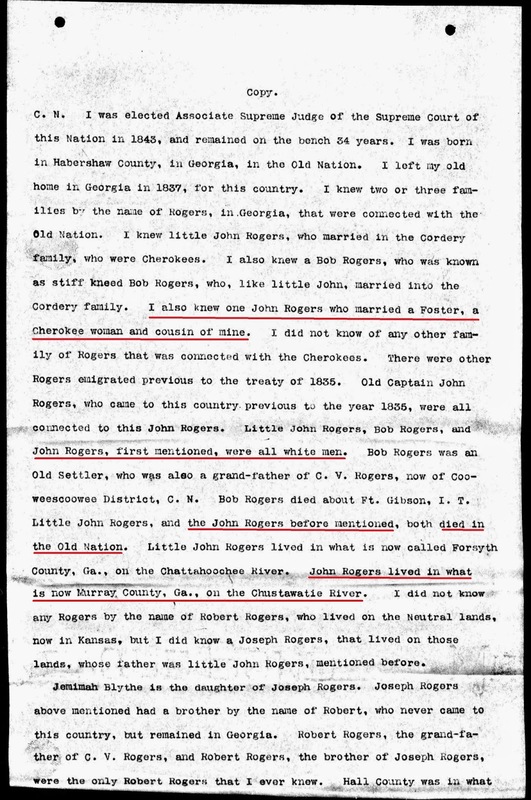 We have the testimony from John T. Adair that says his cousin, a Foster, was married to a white man named John Rogers who lived on the Coosawattee and died in the east. We also have James Foster's request that one of his valuations be transferred to his daughter, Tiana Rogers. That gives us the full name of John Rogers' wife, Tiana Foster Rogers. and that in 1836, he died. There is a lot more information on this John Rogers and his family, but by now, hopefully it's clear that Coosawattee John Rogers was the husband of Tiana Foster; he died in the east before the forced removal; and he was white. But what about that notation on the 1835 Census that said Coosawatte John Rogers' family had removed to Arkansas? If Coosawattee John Rogers died in the east before the removal, it makes no sense that the census says he moved to Arkansas. Did Coosawattee John Rogers and family truly remove to Arkansas as the notation on the 1835 Cherokee Nation census suggests? A letter on the topic of the Emigration of Indians, dated, 17th August 1833, says, "Mr. Currey informs me that Samuel Ballard and John Rogers, two white emigrants at the head of Indian families, have returned to the old nation." Underlined in red, we have John Rogers, husband of Tiana Foster, removing to Arkansas and then returning to the Old Cherokee Nation East afterward. Underlined in blue, we have information that says John got sick and died in the Old Cherokee Nation East. 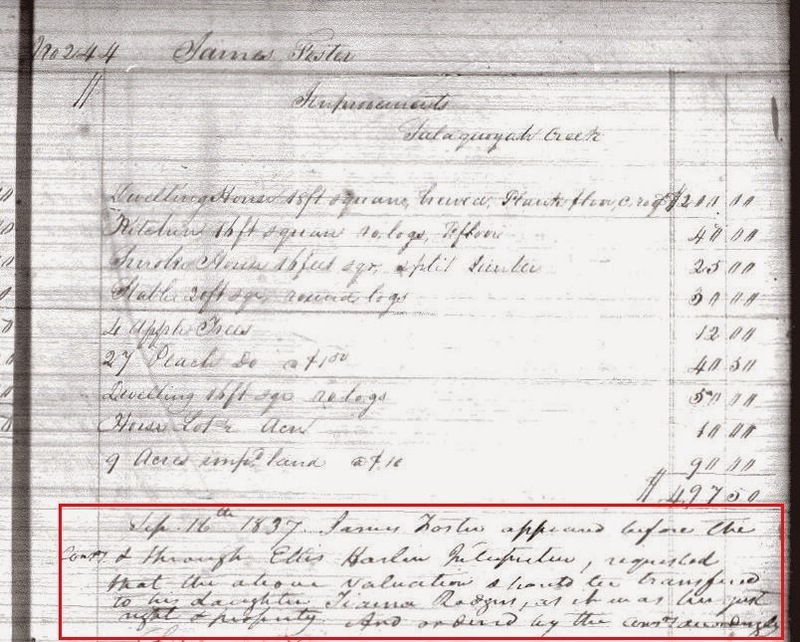 Those two little pieces of information explain the notation on the 1835 Census. Tiana Foster's husband, John Rogers, emigrated to the west, but later returned to the east and died. While that appears to be the end of the story for Coosawattee John Rogers, it isn't. Approximately 60 years after his death, a family who had lived in Arkansas since 1829 attempted to gain citizenship into the Cherokee Nation based on purported descent through him. They went so far as to hire an attorney to help them prove their claim, probably assuming the Cherokees had no records, therefore the claim would be easily approved. They were wrong. Though they did all they could to try to convince everyone they were Cherokees and had a right to share in Cherokee Nation assets, they were rejected. They appealed and they were rejected again. They should have been. They were not Cherokee. No matter how badly that family wanted it, no matter how much their descendants now desire it, "they cannot alter the state of facts and evidence." All false claims of Cherokee ancestry fall apart under scrutiny. The claim the family made was a weak one. It's clear they had no understanding of Cherokee history. They claimed whatever appeared might work in their favor. They started out claiming one John Rogers, who was white, and evolved into claiming another later. 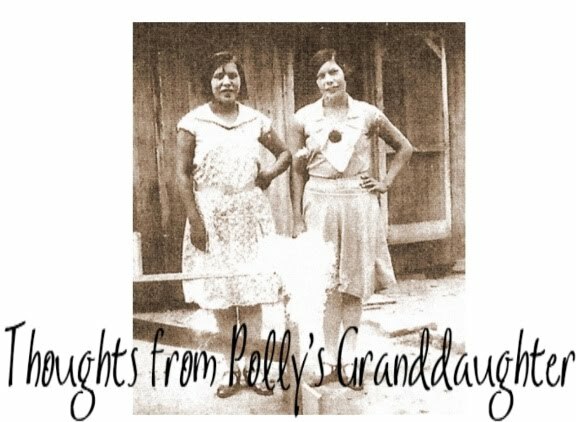 They claimed their ancestor was both an Old Settler Cherokee and an Emigrant Cherokee without realizing that was a problem. They also used standing witnesses, and we all now know what that means - they paid for false testimony. That's an indication that the claim was fraudulent and the family knew it. Stay tuned as the series continues. Coming soon are discussions about a different John Rogers, standing witnesses, the "sin" of living among Indians and why all this matters. A good amount of detective work in your work, outstanding as usual.